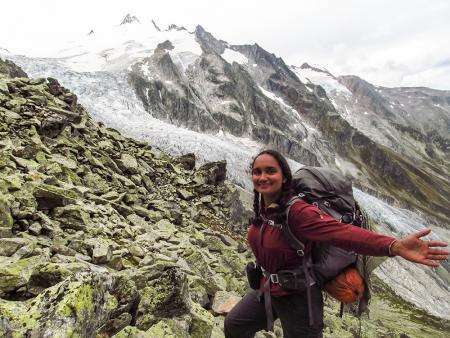 This past summer, not long after collecting her degree from Caltech and thanks to the support of a Watson Fellowship, Hima Hassenruck-Gudipati (BS '14) found herself walking alone along a creek near the northern Italian town of Feltre, about 50 miles north of Venice. She was not vacationing, but instead was on the hunt for the site of a particular type of rock that offers clues about the most rapid and dramatic climate change in Earth's history. Normally, Hassenruck-Gudipati would have tracked her quarry using its GPS coordinates. But on this day, confident that she would find the site easily, Hassenruck-Gudipati only had a map and a field guide with pictures of the rocks. It was not the wisest of decisions, she realized after discovering that the area had no trails. Although unsure of which direction to go, she continued upstream and hiked for hours, searching. Surprisingly, instead of exasperation, she felt exhilaration. "I felt like an explorer," she recalls. Eventually, Hassenruck-Gudipati found the site, an outcrop that formed the tall channel bank of the river along which she walked. The outcrop tells the story of the Paleocene-Eocene Thermal Maximum, or PETM, an ancient climate event that occurred some 55 million years ago. During the PETM, the planet's temperature suddenly spiked as much as nine degrees Celsius over just a few thousand years—a blip of time on the geologic scale. The PETM is one of the best known examples of past climate change, on a par with the Permian-Triassic mass extinction 250 million years ago, when the globe warmed by as much as eight degrees, wiping out about 90 percent of marine species and 70 percent of the animals on land. Studying such dramatic climate shifts in the past can help scientists better understand today's warming world. It's a topic of particular interest to Hassenruck-Gudipati, who majored in mechanical engineering but minored in geology at Caltech. During her time at Caltech, she was keenly interested in green technology and how engineering solutions can mitigate the effects of climate change. But she also developed a fascination with the complex ways Earth responds to a shifting climate. An introduction to the PETM during her junior year left her intrigued; she wanted to learn more, and thought it could be a great topic for a Watson. The fellowship, established by the Thomas J. Watson Foundation in 1968, offers graduating seniors of "unusual promise" a $28,000 stipend to support independent study and travel outside the United States. 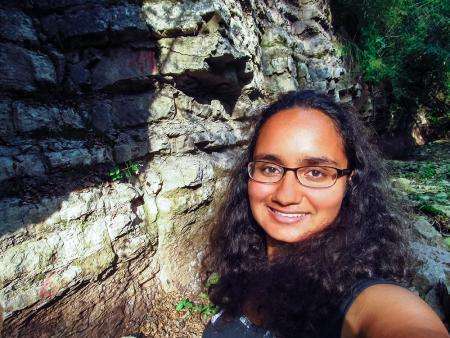 One of 44 students awarded the fellowship for the 2014–2015 academic year, Hassenruck-Gudipati is now a few months into a yearlong, worldwide quest to understand the past, present, and future of climate change. She spent the beginning of the summer in Italy and is now in Spain. Her itinerary is constantly in flux. "It's how the fellowship is set up," she explains. "They encourage you to shape your itinerary based on what inspires you in the different places and take advantage of new opportunities as they arise." Currently, she plans to visit Australia in November and then to head to New Zealand, Nepal, Norway, and possibly South Africa. At each location, Hassenruck-Gudipati has identified geologic sites that will offer insight into the PETM or Earth's response to a shifting climate. In New Zealand, for example, she will collect fossilized pollen to probe how plants responded to the PETM. In Nepal, she will focus on how climate reshapes mountain landscapes by studying the effect of melting glaciers on erosion. On a Norwegian island called Svalbard, located close to the North Pole, she will study the extremes of both past and present climate change. Hassenruck-Gudipati often teams up with geologists from local institutions, but for the most part, she is on her own, traveling via bus, bike, or her own two feet, as conditions require. Near the Italian town of Gubbio, a woman camping nearby commended Hassenruck-Gudipati for her bravery, for traveling alone. "It was news to me," she says. "I never thought of myself as courageous before." Did nobody tell this woman it is all a liberal trick? A leftist version of "WMD!"?? Have you ever considered that you are a fundamentalist? Think about your belief, think about the belief of a fundamentalist. See if there are similarities, if there are, consider. Remember, you don't HAVE to believe what you believe. They had cars in the Flintstones. this is obviously the cause of this warming period. Noumenal, belief has nothing to do with it. It is all based on education and evidence. I earned a Master of Science in this field in 1982, and have watched as the conditions got worse even faster then we originally feared, because of the politicization of science. Sssh, don't tell the international climate chance police (IPCC): man made heating is always worse than anything in geologic history. This can't be true. freeiam, look up the ten hottest years in history and get back to us. Belief has a lot to do with it. There is general consensus amoung climate scientists that your interpretation of the data is not correct. There is overwhelming evidence. If you take carbon, which is a greenhouse gas, out underground storage and pump it into the atmosphere, and do this a lot, how is it even possible (bar some magical carbon sinks) for it to not affect the climate? Noum, I agree with you apparently, but from my education, not blind "belief". That word implies faith to me. What is the point of all this? She is scattered all over the place. She needs to narrow her focus. gkam - It's obvious you don't have a good education in science when you use straw man arguments like "look up the ten hottest years in history." That's a line that simpletons use and shows they are clearly confused when it comes to Earth history. It is no strawman, it is evidence of our condition. I spent my life in engineering with a MS in Energy and the Environment. It is happening, whether it is easy for you to accept or not. It is not a matter of debate, it is a matter of measurement. She is not a Geologist or Scientist, she is on an all expenses paid vacation, hiking and looking at rocks without a GPS, rock hammer, or compass, just a tourist field guide with picture of rocks from a much hotter time in earths past. Did she find those rocks?? I am sure she does not know! What did she learn, only that described in the tourist field guide. What a misleading headline and stupid story. Are you sure the limitations are hers, and not those of the reporter? "Did nobody tell this woman it is all a liberal trick? A leftist version of "WMD!"??" Your sarcasm missed it's mark. Noumenal took your remarks as coming from a denielist troll. And I took his first comment as coming from a denier. Sorry for the down vote on your first comment. Confusion reigns. What???? There's been warming before we dastardly humans occupied the Planet. I do find that hard to believe. Surely it must have been caused by some precursor race that all trace of has been lost. That level of warming cannot have been natural. Yachter fails to understand there may be many causes for the same calamity. One might hypothesize that we humans are not the first species to inflict this sort of forcing on Earth's climate systems. And to anticipate the inevitable response: what sort of evidence of our civilization will be definitively detectable in 55 million years - particularly if something additional - like say global nuclear war - were part of the equation? I read somewhere that would leave behind something akin to the K-T boundary - that might be a leap too great but there is no real penalty in that is there. In fact, a species of bacteria called "Methanosarcina" is implicated in the Permian-Triassic Extinction, AKA "The Great Dying," the most deadly extinction event in the history of the planet. The Great Dying killed 90% of all ocean species and 70% of all land species. And when plants evolved clorophyll, they precipitated the Oxygen Catastrophe, which killed off almost all the anaerobic microfauna of the time, about half of all species. If that's what you meant, then yes, it's happened before. So you have no faith in your ability to prove to anyone what is going on without referencing the work of others? Please stop playing silly rhetorical games. Someone hungry for some switchgrass? I always find it fascinating when ordinary people get all excited and proclaim their belief that global warming is a fraud. After all, the demographic of denialists is skewed towards the poorer, less-educated segment of the population - the very same group that stands to suffer the most from the effects of global warming. Why then do they act against their own interests? My personal theory is that they do it for the same reason that poor people in the South vote for republicans (again against their own interests). They've erroneously tied something sacred, such as religious beliefs or nationalistic beliefs (such as a hatred of socialism, which they mistakenly equate with communism), to some feature of the physical world. Thus, if they acknowledge that global warming is real, they believe they are betraying God or Democracy, and thus they resist it with a fanatical zeal. In business, politics, law, religion, and the other fields we invented fudging is part of it. In science it is death. Thomas Franks' "What's the Matter With Kansas" is a good starting place. Typically, these people would be refered to as "useful idiots" or "greedy and ignorant" or "the bourgeoisie" or "the programmed"(both genetically and culturally). They form the shockfront of the Reactionary Right. We could speculate endlessly, but there is mounting evidence that such are literally made -in utero- and then further hardened via socio/politico/religio/economico means. They are as rife as mushrooms after a rain, and you don't have to look any further than this very forum for plentiful evidence of the fact. I have hoped, for a variety of reasons, that such a hard-wired condition would not exist. Most obviously is the fact that for humanity's sake, we need to be able to act with a common perspective on reality. Some research that I have read recently has suggested that some individuals may have an innate basis for an inability to adjust to, or evaluate, evidence that is contrary to a previously held belief. This trait being irrespective of both intellect and education. The research has customarily categorized the findings in a liberal/conservative, neophyte/neophobe framework. Analyses of findings generally include an evolutionary explanation of the positive effect that such a trait has had on human survival. Although that may well have been such, it's continuance is a detrimental non-necessity. In light of my previous comment, it is human nature that no one wants to be wrong, initially for their own personal sense of the world they live in; inevitably to be correct when some cause arises to defend, or espouse, the viewpoint they hold. I cannot say how others consider the validity of their perspective(s), but I decided long ago that I would rather reconsider, and adapt to, any new evidence that emerges. I would rather change my mind under the light of new information, and feel comfort in the warmth of reason. Change never hurts if it means I am better informed. "I would rather change my mind under the light of new information, and feel comfort in the warmth of reason." It sounds good, but my own "warmth of reason" came with eleven weeks in the hospital after I loudly changed my mind about the Vietnam War, . . . while still in it. Not the "adventure" they promised. Glad you survived the on-location protest. After graduating from HS in '71, I had massive trepidations about the politics involved. I did NOT want to be a disposable tool for the chest-beaters, military/industrial complex, and politicians who had plainly failed to work it out. I was in the next draft lottery. I won. My number was 289. Your change of viewpoint must have been quite an experience. A lot of folks were harassed for their "wrong attitude" on that war. Mando, I was told I would not survive, my group overseas was told I died, and I just waited my turn in a group of terminal patients for blood cancers. I am the only survivor. BTW, while I was "dead", I got promoted to Staff Sergeant. The service works in strange ways.